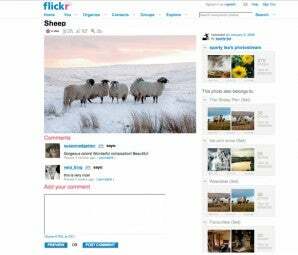 Having prepared your images for display on the Web, click Upload Photos on your Flickr Home page and choose the files. (Or, using the downloadable flickr uploader, drag your files onto the window.) On clicking Upload, give each image a title, a description and a tag (so it’s searchable) before the photos crawl up the wire. Or you can do it after. a name and description. You can add images any time. If you want feedback on your photos, take time to comment on the work of others. Flickr is all about community. If you find an engaging image while logged in, stop to make comment, then Preview or Post your comment beneath the last comment made. If you want to change or delete it, there are links for such a purpose. When browsing the work of fellow flickrites, if you see a photo you like mark it as a favourite by clicking on the star icon at the top left of every photo. The image will be displayed as a thumbnail on your favourites page. You can go to this page any time and browse your favourites, click on them to view or click on the star again to delete them from the page. Photographers whose work you admire can be marked as contacts. When you mark someone as a contact they get an email telling them. Latest uploads from your contacts appear on your home page. You can also subscribe to alerts that inform you whenever they’ve uploaded new pictures. There are thousands of groups you can join on Flickr. There are groups for owners of specific cameras, and people from particular regions. There are also groups that set challenges or play photo-based games. You can view photos and forums of each public group (some are private) and set up or join a group simply by clicking the relevant link. A quick way to view comments people have made about your photos, and see which have been marked as favourites, is to go to the ‘You’ tab and select ‘Recent Activity’. You can select any timescale from the last hour to the last month. Under each thumbnail you’ll see the number of views, comments and favourites each shot has received. If you’re a well-travelled soul you can plot all the places you’ve been on a map. 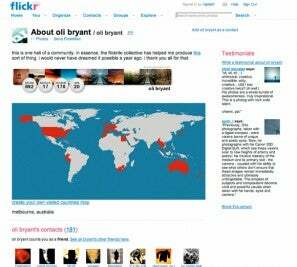 Flickr also supports Geo-tagging, in which you can plot all the individual pictures you have taken on a world map, and you can even zoom in to individual streets, like Google Earth. You can customise your map, and make it private. The Explore menu is a good place to browse the pictures. Flickr has its own word – ‘interestingness’ – that is applied to shots that get lots of views, comments and favourites. The Explore menu offers several ways to view them: randomly, by date, etc. You can also use the search pane to locate people (by their user name) or pictures (from the tags).